Julie is a graduate of Central Aroostook High School of Mars Hill where she graduated as the schools’ all time leading scorer with 2164 points. She also left high school with over 1000 rebounds. After being named a second team All-State selection her junior year, she was a first team choice as a senior. 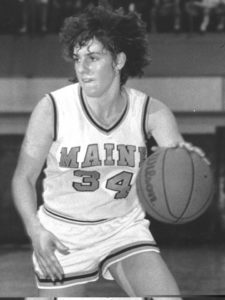 At the University of Maine Julie co-captained coach Trish Roberts’ team her senior year. She was a second-team All North Atlantic Conference player for two years and was a two- year NAC All-Academic team selection.